Last October, Rachel de Rosset and Peter Varga travelled to Atlanta to present their research at the International Writing Center Association’s annual conference. Conference presenters from around the world included university faculty, writing center directors, and graduate students. De Rosset and Varga are seniors at The Catholic University of America. Research has been at the heart of Catholic University’s mission since it opened its doors 130 years ago, and today undergraduates have unique opportunities to collaborate with faculty on cutting-edge research projects and to conduct their own independent research. Similarly the University’s location in the nation’s capital gives students internship opportunities unimaginable anywhere else. De Rosset, an English major with minors in history and Spanish; and Varga, a psychology major with minors in neuroscience, philosophy, and theology and religious studies, began their research in the burgeoning field of Writing Center Studies as part of Catholic University’s Writing Center Undergraduate Tutor Program. Students accepted into the highly selective program take a course on Writing Center Theory and Practice and work in the writing center, assisting their peers with writing. The program also encourages undergraduate tutors to undertake original research and to present that research at conferences. Varga brought his training in psychology into his research at the Writing Center. He wanted to test how the tutorial sessions affected students’ confidence about writing. Both De Rosset and Varga used surveys to gather data for their research projects. The two have joined forces in their research, with Varga now looking at the role of gender in a continuation of his study. Both are continuing their research longitudinally this semester as an independent study. Dante Nicotera works with in a biology lab on a research project exploring how cells become multidrug resistant. Faculty research was one of the features that drew Dante Nicotera to Catholic University in the first place. The focus on molecular and cell-based research in the biology department was appealing to Nicotera, who is double majoring in Biology and Psychological and Brain Science. 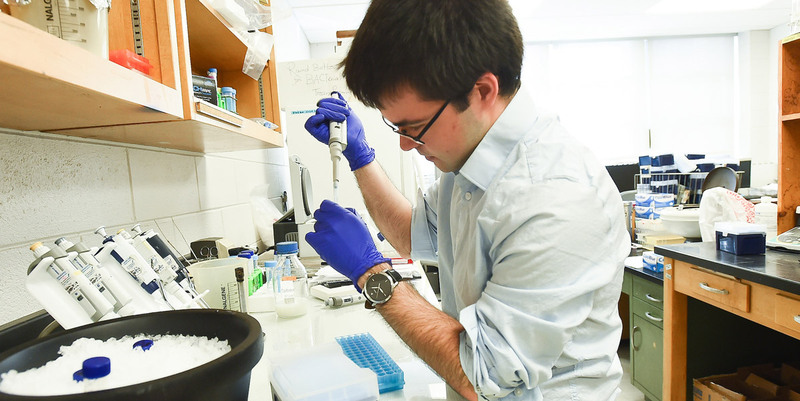 Now a junior, Nicotera works alongside faculty and graduate students in the laboratory. He has presented his findings at Catholic University’s annual Research Day, and by the time he graduates, Nicotera will have been published as a co-author on at least one scientific paper. The undergraduate biology curriculum is designed to give students a progressively more sophisticated laboratory experience their freshman and sophomore years. Students can then use those skills to work in biology faculty labs or in off-campus internships. Nicotera is now one of five undergraduate research assistants working alongside graduate students in Professor John Golin’s laboratory, which studies the molecular mechanisms by which cells become multidrug resistant. "There used to be this idea," says Golin, "that only graduate students had the level of sophistication and experience required, but it's really not true ... In my lab [undergraduates] make major contributions to publications ... It's the rule and not the exception." 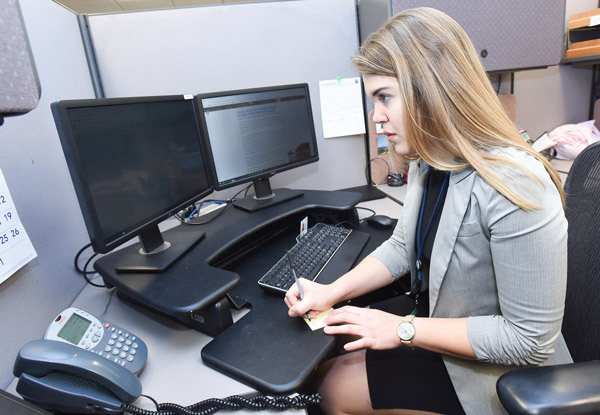 In addition to unique research opportunities on campus, undergraduates at Catholic University have many unique internship opportunities beyond the campus. Each year, Catholic University students work “on the Hill,” and for many, it’s this unique access to internships in politics and government that draws them to Catholic University in the first place. 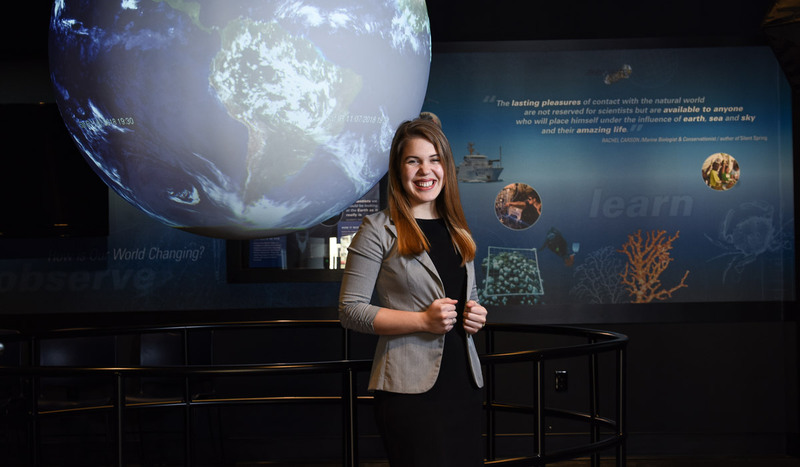 Keeli Otto serves as an intern for the National Oceanic and Atmospheric Administration (NOAA), an agency within the Department of Commerce dedicated to studying climate, weather, oceans and coasts; predicting possible changes; and sharing that information with the public. “My dream is to eventually go to law school and study environmental law or criminal law,” Otto says. Working for NOAA has given her an insider’s view of what environmental advocacy work could look like. Keeli Otto works at her internship at the National Oceanic and Atmospheric Administration (NOAA). Working for NOAA was possible for Otto both because of Catholic University’s central location and because the history department at Catholic University strongly encourages students to take internships for course credit. "In the history department we strongly encourage all of our majors to take internships for course credit,” explains Julia Young, associate professor and director of undergraduate studies within the department. “We help them identify internships and when students do land internships, we invite them to take HIST 494, a 3-credit course that counts towards the requirements for the major. We try to make the whole process as easy as possible because internships give students vital professional experiences that make them more competitive on the job market upon graduation." 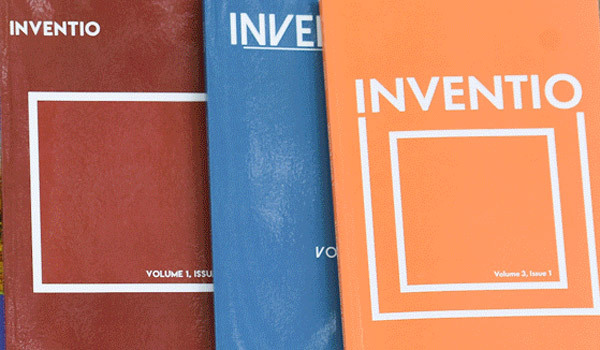 Submissions to Inventio undergo double blind review by the Faculty Advisory Board and essays approved for publication undergo a second double blind review process overseen by the Student Editorial Board, which ultimately makes the selections for and produces each issue. In order to improve the quality of their submissions, authors commit to cooperating with a rigorous copyediting process. In the last three years undergraduates at Catholic University have also published in outside publications including: History Matters, Washington History, Studies in Intelligence, Nucleic Acids Research, Biochimica et Biophysica Acta (BBA) - Biomembranes, FEBS Letters.